I’m amazed. I’m beginning my fifth year of retirement. Year 1 was great; year 2 found me hospitalized; recovery in the third. C-diff put me down for months beginning last July. Fortunately there’s been no recurrance. But it led to a pretty uneven, sometimes rocky year four – relapse and recovery, I’ll call it. I could call it “The year of the wood stove.” From October through March I built a daily fire burning over a cord of wood. Many afternoons were spent in front of the stove with a book or late afternoon nap. The year could also be labeled, “The year of the new dog.” Nala came in November. She is a medium size black rescue from Alabama (we’re not sure, Border Collie? Labrador?). From the beginning she was easy going, calm with minor bad habits. She even gets along with CheCho, the cat. With Nala it’s been “The year of walking.” I’ve been walking fairly regularly since retirement on the canal behind our house. A mile has been the typical walk. Diane walks Nala locally in the early morning but likes to take a late morning or afternoon longer walk. She drives somewhere. I skipped most cold days in winter but with Spring weather I have gone more frequently. We might go somewhere on the Delaware Canal. In New Jersey there is Washington Crossing State Park, Goat Hill Overlook (above Lambertville), Baldplate Mountain, Fiddler Creek, Rosedale Park (with a dog park), Mercer Meadows . . . We also go to the Delaware and Rariton Canal near Stockton, Prallsville Mill or Bulls Island. A ranger at Bulls Island recently guided us to a huge dog part in Horseshoe Bend State Park in Frenchtown. It’s a long ride but a nice outing. Closer to home is Core Creek and Tyler Parks. We might do some of this walking self-motivated but it’s necessary when you have a dog. Some days we include food shopping as part of our outing. There is always NonSuch Farm outside Doylestown. We sometimes do much of our weekly shopping there. A great selection of local vegetables, fruit, dairy, meats, breads and snacks. On a longer drive to Peace Valley Park, we will go to Tabora Farm, fantastic bakery, and good take out sandwiches to eat at Lake Galena. In New Jersey, there is Blue Moon Acres outside Pennington. Their micro greens are famous but the market stocks all local product from Griggstown pot pies, to cheeses, produce, honey, and preserves. They also run some classes and special events. In Hopewell we go to the Brick Farm Market. They have a good take out deli and backery, meat and cheese counter and some local products. Near Titusville is Gravity Hill Farm, a small market featuring their produce and plants, they also host Roots to River Farm (New Hope) and the Farm School. Diane and I, Jenny, Eli and Viv have all taken cooking classes at the Farm School. We also go go several seafood markets, Nassau Street, Buckingham and Heller’s in Warrington. We took several trips to Island Beach State Park in early Spring. It was cool and windy but we can take Nala on a Beach walk; we’ll sit in the sun for a while, then drive to Point Pleasant’s Shore Fresh Seafood Market, local flounder, local scallops. The best. Food adventures include our “weekly” lunches out. The Pineville Tavern is a standard. I recall going there in the 70s after working with John Paglione on the Daniels’ farms — milk cows, chickens and hay. No craft beer then; did we drink Bud? We try to find new restaurants. The Blue Bottle in Hopewell was a great surprise. Don’t let the plain track house fool you; the food is excellent. We also really enjoyed finding Under the Moon in Lambertville, Spanish, some tapas. Inn of the Hawke and Marhaba were also new in Lambertville. We also rediscovered several local restaurants this year. We returned to the Lambertville House and Earl’s in Lahaska (closed due to a fire). We would go back to both. The Brick Hotel in Newtown was the subject of a TV expose. Hard to imagine returning there but we read that the restaurant had a complete make over and new owner, Rocco’s at the Brick. The porch was delightful on a sunny winter; food was great. We went back with Pagliones. In the 1970s the Washington Crossing Inn was a favorite. But it changed hands and we stopped going. This Valentine Day we returned to an excellent meal and great server. Similarly, in the 1990s, Bowman’s Tavern ( a different name) was a favorite. Their wood grilled pork was one of my early retreats from a vegetarian-chicken menu. It’s back on our list of good nearby lunch spot. Doctor appointments and the theatre provide reasons for eating in Philadelphia. We tend toward lunches the past few years. Talula’s Daily is near my doctor’s office. We’ve gone to Jones and Amada after appointments. The Plough and the Stars and Amada after shows at the Arden Theatre. Had a lot of Garces gift cards and thought we should use them given his financial troubles. Our only evening meals this year were Cafe Bombay in Bristol, Mica in Chestnut Hill and several nights out at the Yardley Inn. Our big meal out was a 50th anniversary party brunch at the Black Bass. Several sites were considered and several guest lists developed but given my medical issues, it was delayed a few weeks and just immediate family were invited. Jenny organized everything and it was a fantastic afternoon. Fifty years; difficult to imagine. We went to fewer theatre shows this year. Last June during our trip to Long Beach Island we saw Footloose — an afternoon performance in the reopened Surflight theatre. Lots of slow walkers, canes and several wheelchairs as we join the afternoon theatre goers. We also saw A Doll’s House at the Arden; but nothing at McCarter. Our Christmas play was taking the kids to see Annie at the Walnut. We also took them to Peter Pan and Snow White at the Arden. Eli has been going since he was four and we realized that he is probably outgrowing children’s theatre. Similarly he and Viv now order off the adult menu. We did a lot less traveling this year. Last June as mentioned, we spent four nights in Long Beach Island. The Victoria Guest House was located on the common in old Beach Haven. I recently read a Time article, “Why doing nothing is the most important thing you can do.” Relaxation, total leisure, hanging out, is important to health and mental well being. So often we are driven by the work ethnic. Even “vacations” can be driven. LBI for us was “doing nothing.” We sat on the front porch or our second floor private porch. We wandered the neighborhood, sat on the bay or the ocean. We swam in the Inn pool. There were plenty of close restaurant choices. We had dinner at well known Black Whale and Parker’s Garage. But the best meal wasz in a quieter classic Italian, Stefano’s. On a rainy morning we went to the New Jersey Maritime Museum. Quite worth the time. But our real find was across the street — Polly’s Dock and Clam House. The bayside signage caught our attention but surprise, a few picnic tables on a dock with tourist fishing boats and teenage boys hanging about. A family was ordering chicken nuggets. I was worried. But on the limited verbal menu was a bucket of clams. Wow. Memories of buckets we ate in Boston. Delicious. Unfortunately we didn’t know it was a BYOB; a cold beer would have been great. In July we drove to Geneseo, NY to visit Kate and Jerry Alonzo. Jerry is a Boston College friend and was the best man at our wedding. He was also visiting us the night Jenny was born. Long, close connection. Jerry is a semi-retired judge, woodworker. Our first major activity was viewing a show of his work, featuring a large piece on Justice. Jerry gave a fantastic tour of the exhibit to a class of special education students. We walked and ate along the Erie Canal, went to a lumber yard where Jerry buys some good wood. Drove around Rochester and walked downtown Geneseo. Visited the local Trappist Monastery where Jerry has built some pews. We saw their new sleeping trailer but rain stopped any attempt to take if for a spin. Diane and I thought we might buy one but aren’t sure now. Could I handle it? Meals at the house were great, Jerry is also a solid cook. Unfortunately my C-dif started on the first night, had no idea what it was. Although I functioned ok during the day, nights were bad and I lost my appetite. We left for Ithaca, NY where we had reservations in a Hampton Inn. C-diff was taking its toll. We visited Cornell’s Ornithology Lab. I was surprised, only a small museum and one walking trail. More a place for research and scholarship. We explored a bit of the Finger Lakes but my appetite was gone and was glad when we headed home. My primary care Doc, Sullivan from Yardley Penn prescribed an antibiotic. It didn’t work; he didn’t respond to calls. The C-dif improved; or did it. At the end of the month we drove to Cape Cod. C-Dif returned with a vengeance. I spent several days with minor beach trips, lots of sitting around the house, no appetite. After a week Diane and I decided to drive home. One of my surgeons ordered stool and blood tests. I got a call. Go to the ER. I was dehydrated. Went to Saint Mary’s. My stay was ten days. The only silver lining was my search for a new GP. I found a functional internist, Val Koganski, not with Penn but I think the man for me. I signed up for his conserge service. Blood work and long office visits, I’m now taking a variety of supplements. But I think it’s helped, restoring energy and quality life. Will see how our relationship plays out. Seeing Jerry Alonzo in Geneseo, in his woodworking shop, creating, showing, even selling, makes me pause, think, what am I doing? Maybe “nothing” isn’t really enough. Then there is David Sears, retired teacher, painting and doing nature sculpture. He’s carved out an new life in Maine. Phyllis Gallagher, retired from Holy Family for several years is shooting pictures, making and attempting to sell canvas prints. Read two of Bill Pezza’s books: “How Bristol Won” and “Homegrown.” Bill has continued to write and is an amazing town activism. What am I doing? We didn’t take any trips in the Fall or Winter. I looked for B and Bs with fireplaces but the cold weather seemed to keep us in Yardley. Finally we decided on a trip to the Brampton Inn in Chestertown, MD in May. We’d stayed there years ago; it was on my radar due to room fireplaces; and had a dog friendly collage next to the main inn. Chestertown was a town I once thought we might purchase a second, then retirement, home. Delaware river flooding washed away the idea. The Brampton cottage was perfect, if expensive. Nala could run free on the extensive grounds. Turkeys, rabbits, deer, snakes, turtles, small birds, even an owl joined her. We used the cottage kitchen for take out. Breakfasts in the main house were fantastic. Nala went to several restaurants. The first was Shaffer’s Canal House in Chesapeake City. Very friendly. Soft shells in season. On our day exploring Rock Hall (with Taylor’s we charted sail boats there in the 80s) we ate at the traditional Waterman’s Crab House. Instead of cracking crabs, we had soft shells. A favorite since I read “Beautiful Swimmers” by William Warner in the 1970s. Actually had them three times on this trip. We took several drive-walk explores in the area. Our first trip for Retirement Five was a week at Town Bank in North Cape May. Diane found a dog friendly fenced cabin and beach. The C-diff aggravated my fistula. So in addition to 10 days in the hospital and follow ups with my cardio Doc and surgeons, I went in for a minor fistula related surgery. Recovery ate up the fall and then the cold winter. The year of the wood stove. To my surprise I only read about 25 books. I started on the four foot stack of film books (for years I taught a course in American film and American culture). As I had done with my photography book collection, I intended to read and then sell. Although I reduced the stack, it still looms high. I also continued my “re-read” program. Memoirs and travel were favorite choices. “Colors of the Mountain,” growing up during China’s cultural revolution. “Bella Tuscany: the sweet life in Italy,” one of Frances Mayles enticements to visit Tuscany. “The Hungry Ocean: a swordfish Captain’s journey.” Linda Greenlaw, a woman boat captain; good read. “On Mexican Time” by Tony Cohen, another couple living outside the U.S. and writing about it. “The Last Man in America” by Elizabeth Gilbert was strange biography of Eustace Conway, nature enthusiast, frontiersman, pioneer. Then there was Michael Pollen’s “A Place of my Own” an account of his building a small private room/cottage in his backyard. And Tony Horowitz’s “Blue Latitudes: boldly going where Captain Cook has gone before.” There is a genre of retracing the steps of famous travelers. A good topic for another blog. “Once Upon a Town: the miracle of the North Platte canteen” by Bob Greene did inspire a blog discussing when Trump believed “America Was Great.” He’d love Greeene’s writing. There were some new books. A selection: “Draft No 4: on the writing process” by one of my favorite writers John McPhee. “Paper: paging through history” by Mark Kurlansky, another book in the single object genre. “Mr. Dickens and his Carol” by Samantha Silva was a Christmas gift novel that I enjoyed. Another gift was “The Reporter’s Kitchen” by Jamir Kramer. I journaled that I need to re-read it. A very difficult read was “The Old Wierd America” by Griel Marcus. It’s about Dylan and The Basement Tapes but not having the music made it hard to follow. Finally about the only local history book I read was “Philadelphia: finding the hidden city” by Joseph Elliot and others. I had hoped it was get me back making my Philadelphia explores but it hasn’t happened yet. I watched about 40 films in retirement 4. Most were classics; some inspired by the film books I was reading. In june it was “The Wild Bunch” (1969) followed by “The Sweet Smell of Success” (1957) and “On the Waterfront” (1954). Then the 40s with “The Lady Eve” (1941) and “On the Town” (1949). Many of the movies were watched from Turner Classics on my I-Pad; some were a Netflix disc or streaming Amazon. Many of the movies like “The Great Santini” (1979), “Bell, Book and Candle”(1958), “White Heat” (1949), “Pat Garrett and Billy the Kid” (1973), “A Streetcar Named Desire” (1951), “Run Silent, Run Deep” (1958), “Back to the Future” (1985), “Spirit of Saint Louis” (1957) and “Midnight in Paris” (2011) were movies I’d seen before. Some were new to me, like “Mozart’s Sister (2010), “Becoming Jane” (2007), “Jackie” (2016), “Sense and Sensibility” (1995), “Peyton Place” (1957), “Paterson” (2016), ” Home Alone” (1990). Sometimes a book or stage show leads me to a movie, watched “Under the Tuscan Sun” (2003). There was “To Have and Not Have” (1944), “Action in the North Atlantic” (1943), and a new Bogart, “In a Lonely Place” (1959), discovered due to director Nicholas Ray. Also watched Ray’s “Bigger Than Life” (1956). Enjoyed “Hugo” (2011) and “Harvey” (1950). Current politics led me to “All the Kings Men” (2006) and “All the Presidents Men” (1976). A few are among my favorites “Beckett” (1964), “Days of Wine and Roses” (1962), “A Thousand Clowns” (1965) and in December, “The Lion in Winter” (1968). I also rewatched most of Ken Burns, “Vietnam.” Another blog topic. “Dunkirk” (2017) was one of the only new movies I saw. Retirement year 4 is hard to rate. C-diff took its toll. We didn’t travel much but enjoyed many local walks, wood stove afternoons. I wrote about fifteen blogs, read and watched movies. I journaled regularly. The garden last summer produced even though I didn’t have the energy to maintain it. This year we added more raised beds and the garden has been doing great. With help from our neighbor, Chris Thomas, I’m planting more frequently, but fewer plants, learning about insect and weather damage. Our “greens” harvest is extending into the heat of summer. I did some baking throughout the year. We visited with Eli and Viv fairly frequently. So what are my goals for retirement, year 5? I should buy a Nikon and start taking more photographs. I need to become more independent, take my Philadelphia field trips. We should plan a longer trip — maybe involving a plane flight, Caribbean, Southwest, Seattle? There are house projects and organizing, selling that we (I) need to address. I had hopes to begin volunteering somewhere; it needs investigation. Finally continuing the grand kids contact, reading, walking, cooking, eating well — all the daily routines that make retirement great. It’s been four months sine I retired. It’s been a good 4 months. Although I started this blog the day of my retirement and continued for several weeks I failed to keep it going. I am determined to change that. I want to record the good life. An update of the past quarter year of retirement. We did get to travel quite a bit — Boston, Hudson Valley, Cape Cod, Nantucket, Vermont, DC and Montpelier Virginia, and the Blue Ridge. Our trip to Maine this month had to be cancelled. I could say all the travel is why I didn’t blog but that would be a lame excuse. In addition to travel, I have tried to do a Philadelphia explore (often by train) about once a week. Diane has joined some trips — Constitution Center, Ebenezer Maxwell House in Germantown, the Parkway walk this past Sunday. Most of my city explores have been serendipity — no plans, wander the city, lunch (Alma De Cuba, Vietnam). Would like to expand this to NYC explores. One day trip was the Paglione-Profy beer Fest. John and I went to four brew pubs and quite a few bars. We have also done quite a few NJ explores or Bucks County field trips. Some routines have been established. Most mornings I walk on the canal — 2 or 3 miles. Some reading in the afternoon and movies at night. Trying to play more music. Actually dug out some tapes — inspired by a book I was reading that profiled a WV group, Trapezoid. We had tapes. Have also continued to cook, particularly bread baking. King Arthur class in VT was fantastic. Some routines have not been established. On the table are bike riding, yoga and meditation. The garden took a lot of time this year. About 300 pounds of tomatoes. And similar harvests of lettuce and other greens, peppers, eggplants, zucchini, some cucumbers, radishes and giant sunflowers. Our herbs did not do well. The gardening is one thing, cooking and preserving is another. Freezing things led to canning when the freezer was filled. In addition to the canned vegetables, I made blueberry jam and a peach-apricot jam. More to follow. The big advance was getting in a fall garden. A few weeks late but hopefully we will get some harvest and the gardens are prepared for Spring. People contact has been a a real fun part of retirement. We have spent time with Viv and Eli — regular baby sitting gigs. I have been in contact with HGP alumni, close friends have visited, and I just meet more people. Whether it is someone on a canal walk, in a garden center, downtown Yardley, riding the train or walking around Philadelphia. I think this is because retirement allows moving at a slower pace. Time to talk, time to smell the flowers. 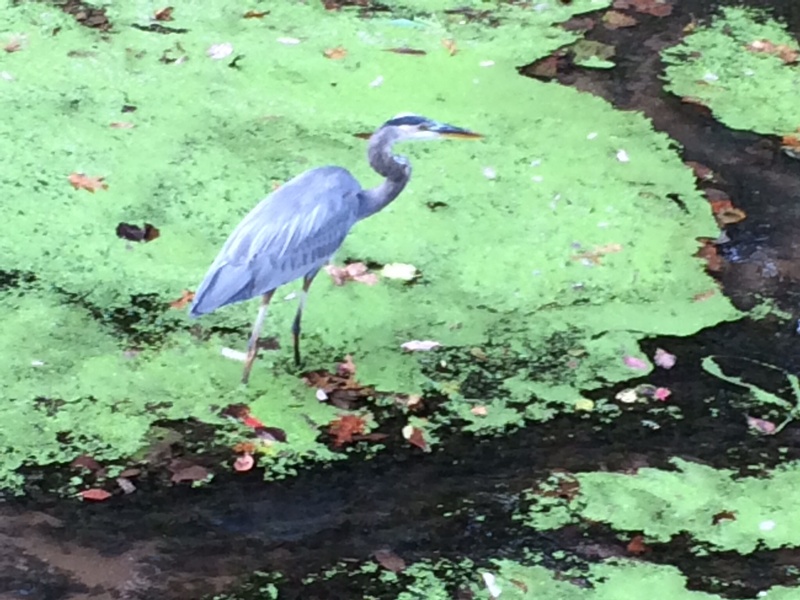 I saw three Blue Herons on the canal this week. I watch them stand, walk slowly, deliberately, pause, stand still, look, another step, then dart forward catching something to eat. My image for today is the Great Blue.